SETI uses the Arecibo's 305-meter telescope — the largest in the world — to scan the sky for signals from alien civilizations all year round. Humans have long wondered whether we are alone in the universe. According to scientists working with the Search for Extraterrestrial Intelligence (SETI) Institute, the question may be answered in the near future. "It's unproven whether there is any life beyond Earth," Seth Shostak, senior astronomer at the SETI Institute, said at a House Committee on Science, Space and Technology hearing Wednesday (May 21). "I think that situation is going to change within everyone's lifetime in this room." The first method involves the search for microbial extraterrestrials or their remains. Investigations include robotic missions to Mars, such as Curiosity and Opportunity, which are currently searching for signs that the Red Planet could once have hosted potentially habitable environments. But Mars isn't the only target in the solar system. In fact, Shostak said there are "at least half a dozen other worlds" in Earth's neighborhood that have the potential to be habitable. Icy moons such as Jupiter's Europa and Ganymede hide subsurface oceans, while Saturn's largest moon, Titan, contains lakes of liquid methane, all of which could make the moons appealing homes for life. Shostak said both of these methods could yield results in the next two decades. The third plan involves searching not just for life, but also for intelligent life — a project that SETI pioneers. By scouring the universe for signals in a variety of spectrums, SETI hopes to find intentional or accidental broadcasts from extraterrestrial civilizations. Determining the success rate of such a program is difficult, but Shostak said that the best estimates suggest that a reasonable chance of success would come after examining a few million star systems. So far, SETI has examined less than 1 percent of those star systems. However, Shostak expects that number to increase as technology advances. "Given predicted advances in technology, looking at a few million star systems can be done in the next 20 years," he said. NASA's Kepler telescope has revealed that planets are abundant in the galaxy. Each of the 4 billion stars in our galaxy has an average of 1.6 planets in orbit around it, with one out of five of those planets are likely to be "Earth cousins." That means there are tens of billions of potentially habitable planets in the Milky Way alone. On Earth, life arose in the first billion years of the planet's 4.5-billion-year history. Its rapid origination suggests that it could arise quickly elsewhere as well, which could result in a profusion of life on planets across the galaxy. "I suspect that the universe is teeming with microbial life," Dan Werthimer, director of the SETI Research Center at the University of California, Berkeley, told the committee. How much of that life might be intelligent is another question altogether. On one hand, although life arose early in Earth's existence, complex — and then intelligent — life took much longer to develop. "This place has been carpeted with life, and almost all that time, it required a microscope to see it," Shostak said. However, Werthimer noted that intelligent life evolved in several species on Earth. He suggested that some planets evolve selective pressures that guide evolution toward different characteristics. On one planet, it may be most beneficial for life to be fast, while on others, it might need to be strong to survive. "I think there are going to be some planets in the universe where it's advantageous to be smart," Werthimer said. Werthimer outlined several of the programs SETI utilizes in its search for intelligent life. 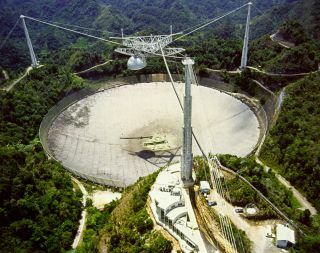 The most well known of these is its use of the largest telescope in the world, the 1,000-foot (305 meters) Arecibo Observatory in Puerto Rico. Although most astronomers would feel lucky to obtain a day of observations with the instrument, scientists at SETI have figured out how to "piggyback" their research onto other observations, allowing for virtually continuous observation of the universe. It requires a significant amount of computing power to churn through the resulting data in search of signals. In 1999, SETI@home was released to allow members of the public to put their computer to work when it might otherwise be idle. Today, 8.4 million users in 226 countries have the program running as a screensaver. "Together, the volunteers have created the most powerful supercomputer on the planet," Werthimer said. When asked about potential safety issues with downloading the program, Werthimer said, "In my opinion, SETI@home is one of the safest things you can install on the computer." He pointed to the millions of users who have put it through its paces over the last 15 years. On top of that, the program is open source, which means that anyone can examine it for viruses or potential problems in the code. In the next few months, SETI will launch its Panchromatic SETI program, using six telescopes to scour the skies for signals in a variety of wavelengths, including radio, optical and infrared. "This will be an extremely comprehensive search," Werthimer said. Another program seeks to eavesdrop on potential communications between two bodies in an alien solar system. Just as NASA sends signals to the Curiosity rover on Mars, or would need to communicate with a future outpost on another body in the solar system, alien civilizations may be in the process of exploring or colonizing their own neighborhood. By using information from Kepler, SETI scientists can observe when two planets line up in another system and attempt to eavesdrop on potential signals. By relying on a multitude of technologies in the search for advanced alien civilizations, SETI hopes to increase its odds of finding intelligent life beyond the solar system. Programs continue to evolve alongside technology, as SETI attempts to put a new one in play each year. "I think the best strategy is a multiple-[pronged] strategy," Werthimer said. "We should be looking for all kinds of different signals and not put all of our eggs in one basket." Shostak agreed, and noted that dated technology, such as radio signals, may not necessarily be obsolete. "One shouldn't discount a technology just because it's been around awhile," he said. "We use the wheel every day." If scientists were to discover a signal that might potentially stem from an alien civilization, the news would spread fairly rapidly. SETI might ask observers at another observatory to verify the data before officially announcing it, but such news would never stay under wraps for long. "The public has the idea that the government has a secret plan for what we would do if we picked up a signal," Shostak said. But he said he's received no calls or clandestine visits for the false alarms SETI has already observed. In fact, Shostak said the news will spread before it can be fully verified. "There will be false alarms," he said. For all their optimism about the potential to find new life, both Shostak and Werthimer were realistic about the limits of their research. Currently, SETI houses only 24 full-time scientists. Of those, two-thirds are from the United States. The Berkeley program exists primarily on a budget of roughly $1 million a year, made up of research grants from NASA, the National Science Foundation (NSF) and private donors. The two primary telescopes utilized by SETI are also in jeopardy. Budget cuts have been made to the Arecibo telescope, while the NSF plans to discontinue funding for the Green Bank telescope in West Virginia. At the same time, China is building a radio telescope nearly twice as large as Arecibo, while the Square Kilometer Array Telescope project is in progress in South Africa. Both telescopes stand to become significant SETI observatories, and the United States isn't involved. "The U.S. may not continue to lead this work," Werthimer said. "I would find that disappointing," Rep. Suzanne Bonamici, D-Ore., responded. Both Shostak and Werthimer expressed their optimism that intelligent life exists somewhere in the galaxy, and that it should be detectable in the near future, as long as SETI continues to receive the support it needs. Between the knowledge that might be obtained from an advanced civilization and the idea of mankind's biological intellectual place in the universe, humans stand to gain a great deal from learning that we are not alone. "Finding other sentient life in the universe would be the most significant discovery in human history," said Committee Chairman Lamar Smith, R-Texas. Put your computer to work by installing SETI@home.